What is an investment analyst? 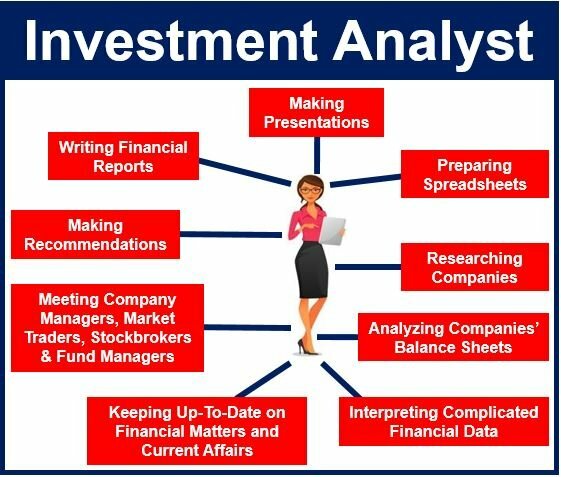 An investment analyst, also known as a securities analyst, equity analyst, or financial analyst, is a person who looks at the performance of various types of investment and advises people on future investments. They provide research and data to help stockbrokers, fund managers and traders make investment decisions. The information provided by an investment analyst helps ensure that investment portfolios are well managed and that potential opportunities are highlighted. Most investment analysts research opportunities and trends at home and worldwide. keeping up-to-date with the domestic economy, world economy, and financial markets. While investment work provides great promotional opportunities and financial rewards, targetjobs.co.uk warns that the role is demanding with very long working hours. In order to be considered for this type of job you must have a university degree in economics, business, maths or accountancy. If you do not have a finace- or business-related degree, it would be useful to have a relevant postgraduate qualification, such as an MBA (masters in business administration). You will need IT, communication, mathematics, and computer skills. If you are interested in financial markets and enjoy research and analysis, being an investment analyst may be your ideal choice. Many employers will only consider taking on applications with foreign language skills. Some employers offer internship placements for undergraduates to gain experience in the field before graduating. Bear in mind that these placements are highly sought after, so prepare well for your interview. An investment analyst will typically specialize in one industry, such as engineering or pharmaceuticals, or concentrate on a particular part of the world, for example the Far East or Eastern Europe. to be a good team player, but you will often have to act on your own initiative. There are many different types of analysts, including systems analysts, research analysts and psychoanalysts. In this video, Rouven, an investment analyst in Spain, talks about his job.